Here’s how to make your way through The Guest Area and use the elevator in Little Nightmares. In this walkthrough of Little Nightmares, we’ll teach you how to make your way through The Guest Area, and help you find the mysterious lady of The Maw. If you’re a bit behind, or simply want to double check your progress, be sure to check out our Little Nightmares walkthrough hub which contains an abundance of information about the game. Before we jump into our Little Nightmares walkthrough, it’s important to note there are 4 Nomes and 2 Statues in this section. Now that you know how many collectibles to be on the lookout for, continue on to read part 4 of our Little Nightmares walkthrough! 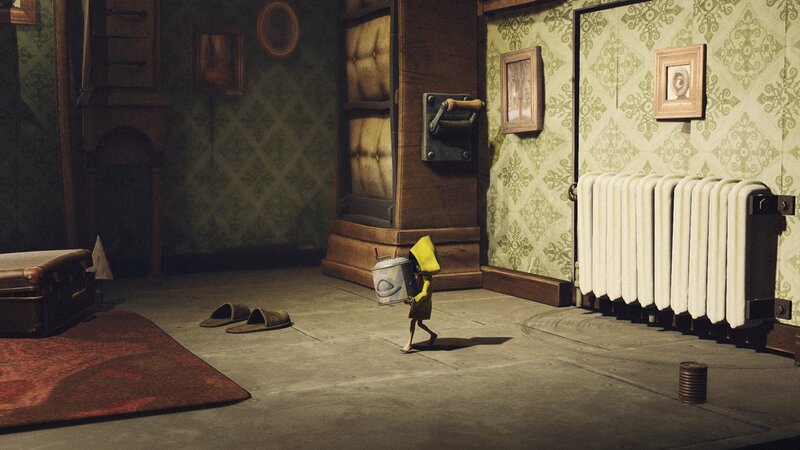 In this Little Nightmares walkthrough, you'll need to learn how to avoid the guests. Once you’re in the guest area, head to your left and into a secret room. There you’ll find a lantern which you can light, as well as a Nome you can hug. Next, head back out and off to your right, then climb up the ladder. When you’re outside, scale the chain and ladder all the way to the top. Next, go to your left and back inside the guest area, then yank the lowest board off the hatch on your left to squeeze inside. Carefully traverse the wooden beams, then climb up the side of the walkway and make your way to the right through a small hole at the top. Next, jump across the hanging lamps on your right before squeezing into a small gap in the doorway. Keep moving past the first eating guest. However, when you move through the next door, you’ll knock down a bottle. This will alert one of the eating guests in the next room, so be sure to run as fast as you can until you reach the next area and the guest stops chasing you. In this area, you’ll come across two guests eating at a table, though they won’t spot you walking around on the floor. Now, you’ll need to climb onto a stool to make your way up to the table. This is where you need to be extremely careful, because as soon as you reach the top, you’ll need to climb the stack of dishes before the two guests can grab you. Once you’re on top of the dishes, you’re safe. Wait there until the lantern swings to the left, which makes it close enough to jump over to (as long as you get a running start). Once you’re hanging from the lantern, swing left and right to build momentum, then jump over to an opening on your right. Next, drop to the floor and head to the right to find a stool up against the wall. Scoot the stool to the left to reveal a hole you can crawl through. Now, crawl through the hole and enter a secret room on your right. 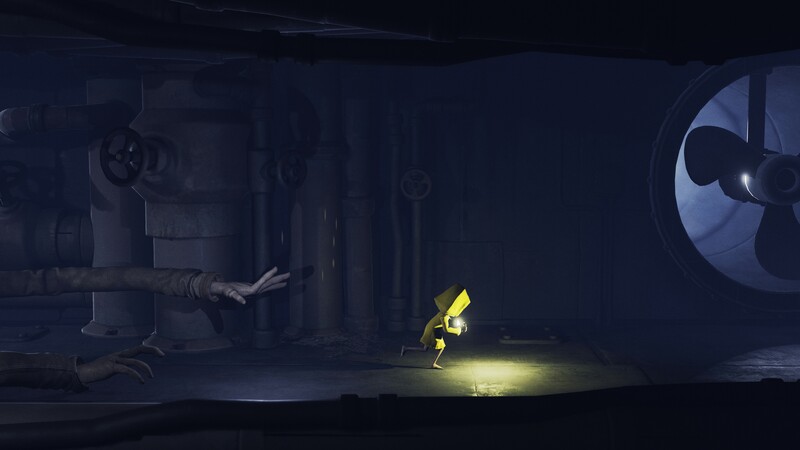 Inside you’ll find another lantern you can light, and a Nome you can hug before contuining on through part 4 of our Little Nightmares walkthrough. 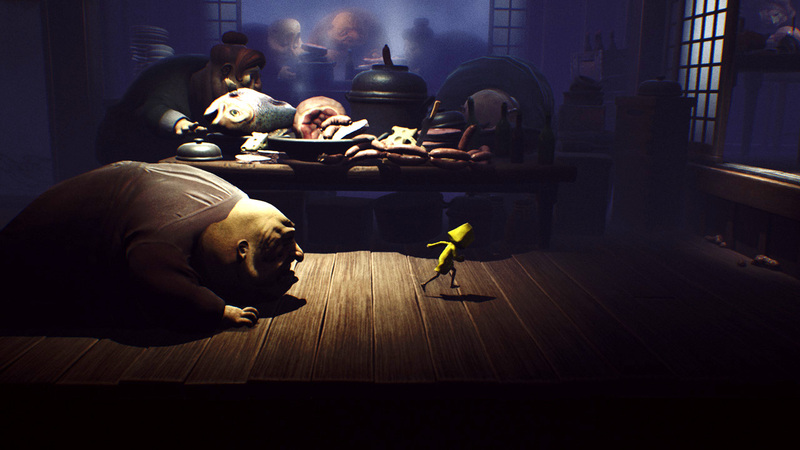 Avoid the hands of eating guests as you traverse the counter in Little Nightmares. After dealing with the collectibles, head to the previous room and over to the right corner. There, you’ll want to climb up the barrel and jump to the countertop. Again, be extremely cautious, as you’ll need to run across the counter all while jumping to avoid the hands of eating guests as you head to the left. Once you reach the far end, climb the crates and jump over to the middle of a grated wall on your left. Scale the wall, then jump to the hanging platform once it swings to the left. Use this platform to jump over to your right, then use the stool in the middle of the room to climb into the backdrop. Once you head left, three guests at a nearby table will come after you. To avoid them, you’ll need to quickly run to your left, up the ramp in the next room, then jump across to the lantern. Use the lantern to swing left, then jump to the far end. When you move through to the next area, a guest on the left side will drop to the floor and begin chasing you. You’ll need to head back to your right and wait for him to slam into the bar, ceasing his chase. Now, climb the set of boxes and jump over the dazed guest before quickly running to your left and sliding into a small hole as he gives chase once more. 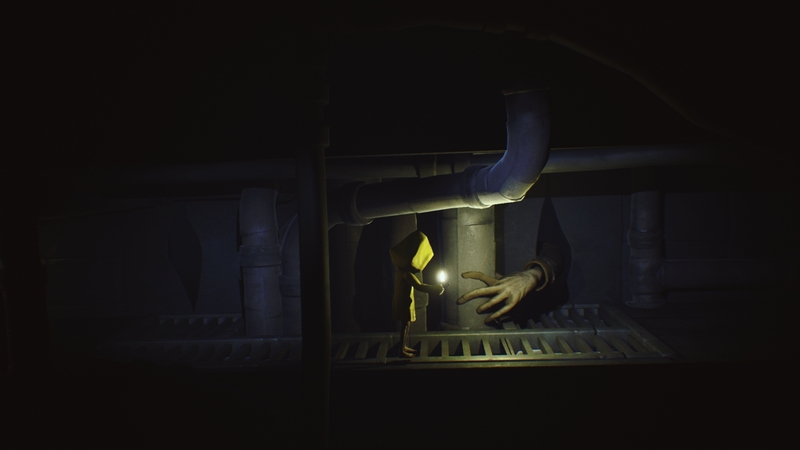 You'll want to pick up a blue can and use it to shatter the mirror in Little Nightmares. In part 4 of our Little Nightmares walkthrough, you’ll find another collectible statue in the room. However, before you can grab it, you’ll notice a chef coming up the elevator. Be sure to run to your left and into the bathroom where you can either hide under the sink, or in the cabinet. When the chef leaves, pick up the light blue can in the center of the room, then throw it at the mirror in the back. This will shatter the mirror and allow you to pass through into the next area. There, climb the grates along the wall in the back and head through a drain at the top. Now, move to the foreground and slide through the bars, then use a hole in the wall to head back into the room on your right. Walk across the elevated pipes until you reach the right wall, then drop on top of the statue you had to leave behind. Next, break the statue, then head into the elevator. When you reach the next floor, track down the lantern and light it before squeezing through the opening in a doorway on your left. In this area you’ll find a Nome and a sleeping quest. Sneak in and hug the Nome, then venture back to the right through the open doorway. You'll need to run past the mob of guests chasing you in Little Nightmares. As you continue on through part 4 of our Little Nightmares walkthrough, the doors in the back will open and a mob of guests will start chasing after you. Here, you’ll need to run into the next room on your right, down the stairs, then continue running to your right. Now, head up the table and over to the hanging lantern, which you can use to swing to the room on your right. If the guests begin to catch up, try jumping while running to move faster (but be wary of become overly tired). Typically, you can jump around three times before Six gets tired, so try to refrain from jumping unless you’re about to be caught by a guest. In the right corner you’ll find a lantern you can light, then continue through the small opening in the doorway. Here, the hunger pains will hit Six, and you’ll need to ignore them as you head into the next area to find food. Once in the area with food, climb up a box and through a hole in the right wall. Keep heading up the ladder but wait for The Lady (who looks like a geisha) to head into the elevator before you open the hatch. Once The Lady is gone, veer off to your left to find another collectible statue you can break. Ignite the lantern in the right corner (background) and continue through the small opening in the doorway to the right. The hunger pains hit you again, but continue into the next room and you’ll find the food you so desire. Climb up the box in the foreground and through the hole in the wall to the right. Continue up the ladder to the far right, but wait for the geisha to move into the elevator before you open the hatch at the top. Once she’s clear, head to the left to find another statue you can break. Now that you’ve broken the statue, pick up one of the cans on the ground and toss it at the elevator button. Finally, head into the elevator to complete part 4 of our Little Nightmares walkthrough. By reading through this guide, you should now be up to speed on part 4 of our Little Nightmares walkthrough.